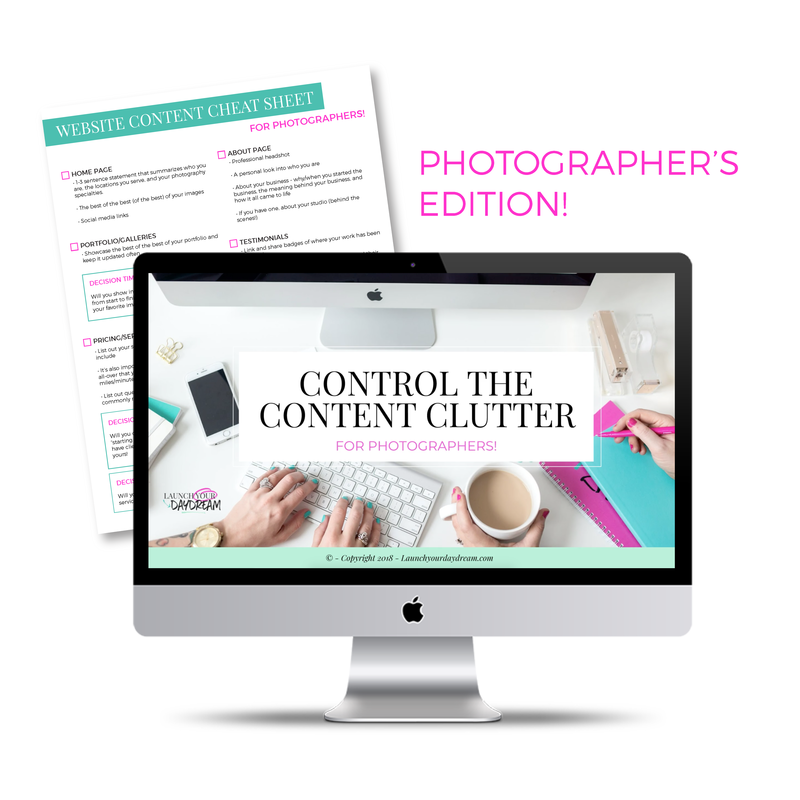 Control the Content Clutter - For Photographers! Your website should be your 24/7 marketing machine for your photography business. But, if you don't have the right content on your website, your prospective clients are going to walk away. I'm too busy to even think about what to put on my website. I'm overwhelmed any time I try to organize it all. I keep comparing myself to other photographers — which gets me super frustrated. I don't even know what the "right" content is. Ever wish it could just be easier!? That's why we're going to show you exactly how to put together the content for your photography website. We'll walk you through which pages to include and get inside your clients' heads on exactly what they're looking for before booking you. That's right — you will walk away from this course with a map in-hand of what to include on your photography website! We'll start with getting inside your clients' heads. You'll want to make sure the questions and thoughts they have will be answered on your website! We’ll provide you with a printable PDF that will allow you to take this course and easily put it to work on your website. It's that easy! We're sharing advice straight from working one-on-one with dozens of photographers — in all types of photography specialties! This course is short and sweet at 28 minutes! We don't want another "thing" added to your growing to-do list. Get this course done quick! We won't let you walk away overwhelmed. Print out the PDF before watching the video to map out your website as you go! It’s time to work smarter, not harder. Let’s put your content overwhelm to bed and get you back to focusing on the business you love so much. Who are Britt + Kelsey!? We're Britt + Kelsey of Launch Your Daydream! We provide wedding professionals and creative business owners with a comprehensive one-on-one branding + website design experience, targeted educational tools + a supportive and engaging creative community. Get Your Access Now For Only $29!